✅ Verified Review | Horrible experience. Our flight from New York left 3 hours late. While we were flying over Brazil the pilot suddenly announced that we will be landing in Brasilia because the crew had reached the maximum time that they were allowed to work. We had to get off the plane, go through passport control, pick up our suitcases and go and stand in line to do the check in again. We were in line for more than one hour because many people in front of us had to rebook connecting flights. Four hours later we left Brasilia for Sao Paulo. We spent all that time at the airport and the ground crew did not offer any refreshments. The plane from Brasilia to Sao Paulo was half empty, however, the flight attendant did not allow us to change seats so that we would have more leg room. The flight from Brasilia to Sao Paulo was just over one hour long and we arrived more than 7 hours later than originally scheduled. It is amazing that the crew could not work for just one more hour and instead about 300 people had to be inconvenienced and many missed their connection. When I called the TAM customer service center I spoke to a man who gave me the most ludicrous reasons as to why the crew could not work for one more hour. I had flown this route many times before with Delta or American Airlines and there were some delays but never this type of situation. TAM didn't even offer to compensate us for the delay. We will never fly with this airline again. ✅ Verified Review | After a long transatlantic flight, the last leg of my flight was with TAM from Sao Paulo to Porto Alegre. When I landed in Sao Paulo, I still had a couple of hours before my next flight. I went to TAM desk for the check-in and the person there offered me to take an earlier flight which was in half an hour. I was extremely happy about this. It's the first time that I was so satisfied with the airline staff. 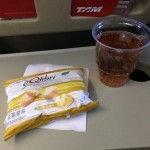 The flight was ok and with some snacks and a drink, nothing too special but as you'd expect in a one something hour flight. 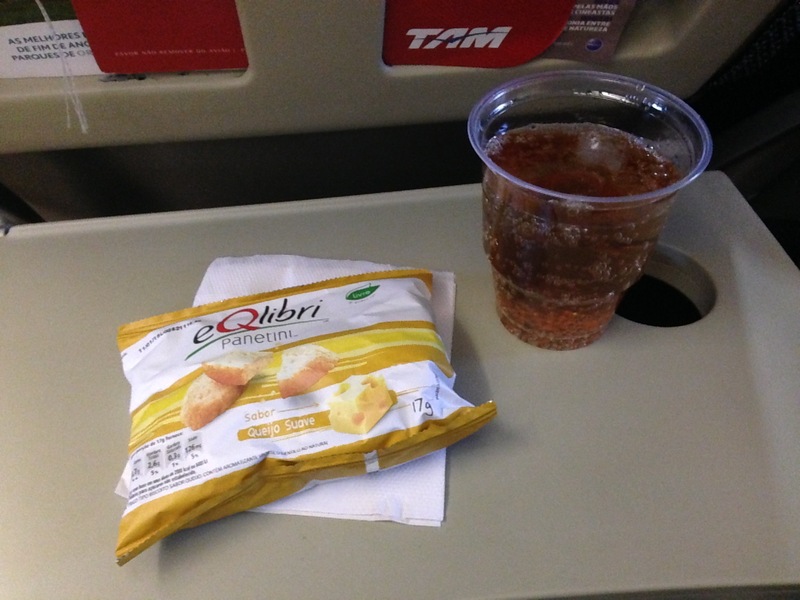 ✅ Verified Review | A rather basic transcontinental flight with TAM Airlines from Sao Paulo to Lima. Soon after take off a hot breakfast sandwich was served, however, after the meal service, for the next 4 hours no drink rounds followed. I was surprised that most anouncements where only done in Portuguese and English, and not in Spanish. Apparently there was IFE available, but only on your own mobile device and after downloading an app before departure. For an international connecting traveller this was not very handy. 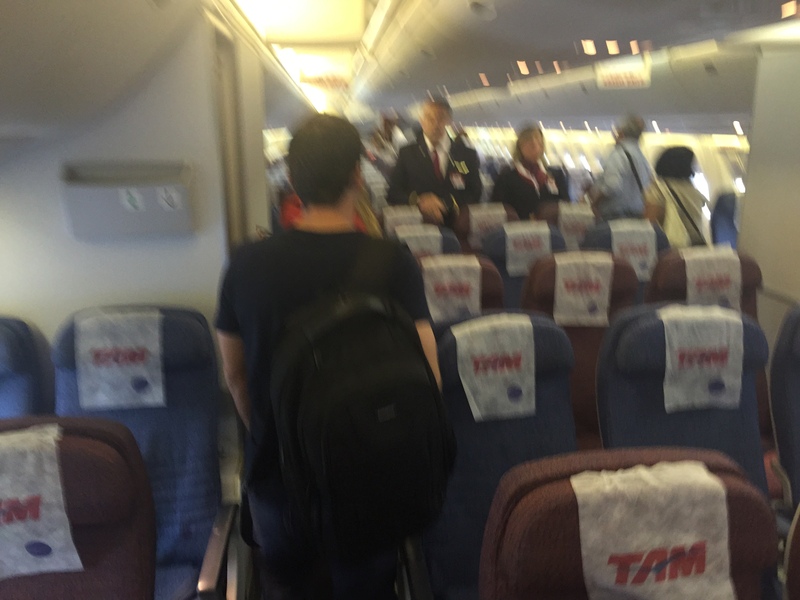 I was returning from visiting a friend in Uruguay, and it involves a full day of travel flying TAM Airlines from Montevideo to London via Sao Paolo. They had in-flight entertainment on loop for 2h 30m flight from Montevideo to Sao Paulo, the flight from Sao Paulo to London was without concern. On the way out, my in-flight entertainment broke, and I had to do without for the flight from London to Sao Paolo. The crew were professional, seats were comfortable. As it was an overnight flight, they offered a two-course eveining meal and breakfast in the moring. All in all, I would recommend it as an airline to fly to and from South America with. "FA was friendly and attentive"
Ground staff of LAN was ok, not overwhelming nice, but ok. Seats in row 42 ok, IFE slow and quality ok. Service of FA was good, friendly and attentive. Quality of food as you can expect in eco. We had a transit at GRU to SCL and had to pass a security check where our water bought at FRA was taken. Strange! Upon arrival at FRA I had a damaged piece of baggage. But the ground staff wasnt interested in any way of alpologizing, but pointed out the rules for such case only. Overall nothing special, but a decent choice to travel to South America on long haul. Frankfurt to Sao Paulo with TAM Airlines. Service was attentive, friendly and acceptable for economy class. Food is as good or less good as with other airlines. Seat is standard and what you get for economy. The IFE is rather slow and not as quickly responding as for example in the 787 of LAN. Overall a good and pricewise interesting way to travel to South America. Luggage was damaged upon return at FRA, but ground staff not interested in being friendly or understanding. 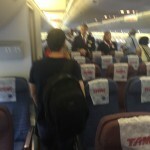 "no staff of TAM helping us"
I was supposed to fly from São Paulo to Mexico City. We landed in Brasilia at 1am with very limited explanations from flight attendants. I am stuck in Brasilia with no staff of TAM helping us. Help has been limited to minimum from now. We had to wait for 3 hours last night (1am to 4am) inside the airplane and then another 4 hours (4am to 8am) to get an hotel room and a replacement flight (an explanation, a smile, a a glass of water would have been highly appreciated). I hope the replacement flight proposed this afternoon will finally take off, as many of us have to go to work tomorrow but it seems that it is not a concern for TAM Airlines. ✅ Verified Review | On our flight with LAN we had to change flights in Sao Paulo to TAM Airlines, retrieve our luggage and check it in again as we were flying a domestic flight to Rio and then to Santiago. There wasn't much time between the connections in Sao Paulo and going through immigration and changing terminals made it almost impossible. With 30 minutes before departure we didn't have our luggages checked in and there was a big line at the counter. The staff on ground made a great job in checking our baggage and then taking us to the plane in a minibus as we were the last ones to board. The luggage arrived safe in Santiago and both flights were on time! On the way to Rio there was a new A319 with lots of leg room and for Santiago an old A320 which gave us a lot.of trouble with many turbulences. The food served on TAM wasn't different from the one of LAN but the staff were extremely friendly. Still, the experience in Sao Paulo looked very chaotic to us and we would prefer LAN for further flights. "worst company I have flown"
✅ Verified Review | I was flying TAM Airlines with family (I, my wife and 2 small kids) from Toronto to New York. Arrived to airport on time, checked in, but they gave us hard time with the baggages. After we passed security, and went directly to the boarding area, airplane was gone without us. When we tried to get our baggage back, one of luggages occurred to be lost (where I had all my clothing). We went to vacation without my clothes, and they found my luggage only after 21 days (when the vacation was over). They screwed up everything, and did not compensate inconvenience. Also, it is extremely hard to find any employee in the airports (we tried in both cities), they are like undercove" officers. I complained in emails many times, but no one ever replied. Phone lines also work terrible. The worst company I have flown! 3 flights with TAM Airlines from Rio de Janero to Asuncion Paraguay via Buenos Aires, which over the eight years I've flown with them has become a pretty bland and mundane experience. Inflight programe repetative pranks show Only Kidding' which becomes tedious and boring. The dated cream and red cabins look grubby and the downgraded meal service and reductions of bar service leave it an airline of neccessity not preference. Best I can say is flights on time and cabin crew of the Paraguayan sector (PZ) far more agreeable. PZ planes definately dated and tired and despite a new and glossy terminal at GRU you are still being bused to and from PZ flights. Long haul LHR - ASU booked for May so lets see how good the 'Magic Red Carpet' experience will be then.